Yevgeny Voitsekhovsky (left) and Pavel Stotsko were married in Denmark earlier this month. Two gay men whose marriage was registered by Russian officials have fled the country after receiving death threats and having the electricity and internet reportedly cut off by plainclothes police who besieged their apartment in Moscow. 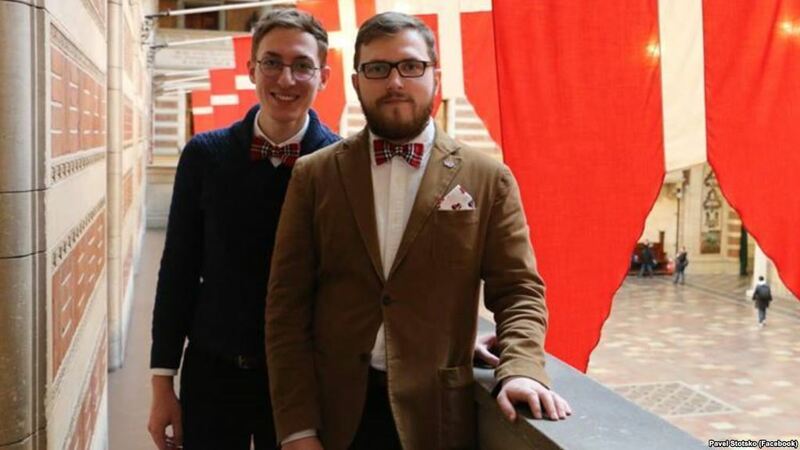 Pavel Stotsko and Yevgeny Voitsekhovsky said they got married in Denmark earlier this month, after which they submitted their passports to a register’s office in Moscow, where a clerk put marriage stamps on the documents. Although homosexuality is not illegal in Russia, gay marriage is. Stotsko said, however, that he had exploited a legal loophole, citing a law that means Russia recognises marriages registered abroad. He posted online photos of the stamps in the passports, a move that sparked widespread outrage. Vitaly Milonov, a Russian MP and the author of Russia’s law banning so-called gay propaganda, said the marriage stamps had no legal validity and likened the couple to “stinking goats”. LGBT rights groups said homophobic attacks had rocketed in Russia since President Vladimir Putin approved the controversial law outlawing the promotion of a homosexual lifestyle to minors in 2013. Dozens of gay men were reportedly detained and tortured in Chechnya, a mainly Muslim republic in southern Russia, last year.